INVERNESS Caledonian Thistle have announced it has been forced to cancel its hospitality packages for the Highland derby tomorrow due to low demand. The match was originally due to take place on Saturday, March 16 and at first sold out all of its hospitality packages. However, when the game was switched to Friday, March 15, it resulted in the number of hospitality spaces dropping to 135. But when the game was postponed and rearranged for tomorrow night, the number of people signed up for hospitality fell to 40. A spokesman for the club said it was no longer viable for the club to offer hospitality packages at tomorrow's big game due to low numbers. He said: "Initially we had sold out all the spaces for the scheduled Saturday game. "When this was moved to the Friday night, due to being shown on BBC Scotland, the numbers dropped to 135. "After the Friday night game was rained off, the game was switched to Tuesday night. "That number fell to under 40 and it became unviable to go ahead. "The companies and individuals who were due to come along on Tuesday night have been contacted and will be offered a discounted deal for either of the two Saturday home fixtures that we have left. "Dundee United on Saturday, April 20 or Dunfermline Athletic on Saturday, May 4. "The club has apologised to those involved." have we now lost the extra profit from the tv money? missing out on hospitality money tonight and giving people discounted packages for our other home games. tv wins again. TV has a lot to answer for but not for this matter. The match would not have gone ahead on the Saturday anyway as the pitch was still sodden. It would have been moved to a midweek date in any event. A solution might have been to discount the hospitality packages and advertise that fact widely including on this site but that would have involved communicating with fans which, as we know, this board seems to find bothersome and inconvenient. The amount of money Championship clubs get from this TV deal is buttons anyway. I'm not sure how accurate the figures are but it's been mentioned that these 1905 TV games are worth about £8,000 to the clubs involved. If that is true it's hardly worth it. Is the Board not to blame and was this a final act of attrition by Yvonne Crook and a dismissal rain dance ? Clubs do not get any extra for a televised league match, it's pulled money that is distributed as part of the overall league income. As long the cameras don't use this listing to navigate. The club would still have lost revenue on hospitality as the numbers dropped from sold out to 135 when it was switched for tv. And I'm sure attendance would have dropped also being on a Friday night for the original match rather than the Saturday. So tv interference has cost the club money whatever way you look at it. Agree with all of this. Hospitality is a luxury buy and to attract the non corporate guest it needs to look value for money. I hate these 1905 kick offs too as such a rush even at home. Agree. A 7.45 kick off is quite a challenge for me on a working day. 7.05 is just about impossible. I am sure many are similarly placed. On the hospitality issue, this is primarily designed for corporate clients and not your everyday fan. For the first derby, the hospitality was sold out but that was because this was a Saturday. If you drop the price too much to then attract the everyday fan, you don't make money and, lets be honest, even if advertised on here, how many would take this up?. The 1905 kick off is solely to allow the BBC Scotland channel to shoe their flagship news show, The Nine, at 2100. Surely for one night, and especially on a Friday night, they could alter the start time of that show. Lets face it, folk will not exactly be queuing up to watch The Nine on a Friday night. Once again this just shows how much the BBC wants to show football but not consider the impact on fans. A 1905 kick off is tight for me to finish work, get home and out to the game and I stay in Inverness. 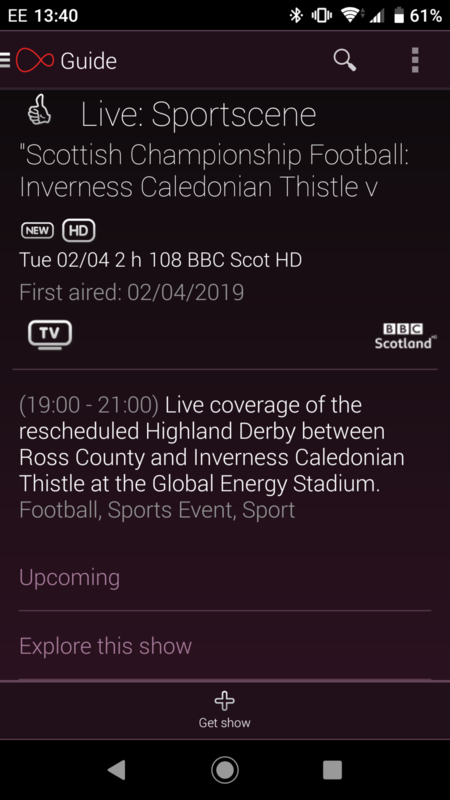 The thing that really annoys with the TV companies is that decisions on what games are being shown is often taken quite late and inconveniences fans who have made travel arrangements already. They should be made to indicate which games they want to show at the start of the season and give fans some clarity. Id have thought in our current financial predicament everyone who attends hospitality would be welcome? Ordinary fans like a day out too? I didnt mean value for money had to be cheap btw. As far as I can see hospitality numbers are well down. Only 50 at ladies day when sold out in previous years. I dont think using County is a good example as that one should always sell well. County, I hate to say it, do this so much better than us with prices to suit all pockets. I do realise we dont have that luxury due to lack of space however. Ladies Day was excellent. Maybe not a big take up (can I suggest that was because it was going to be a pay bar despite lower price). Then days before actual date it was changed to free bar. So many fans missed out on a nice meal (with delicious canapés before), absolutely excellent raffle prizes (Lorna at my table won an exclusive handbag worth nearly £400!) (Kath won afternoon tea with Prosecco at Kingsmills Hotel) and Jason Porter, a tribute singer. He was great - sang before and after game, lots favourite songs, Michael Buble, Neil Diamond, Bee-Gees, Beatles, and more. Then lovely goodie bags to take home. Come on, what more can you want. Bring on Ladies Day next year. Cove in the highland league for a normal league match charge £75 +VAT (£100) for the same product. Is it though? What do you get for your money? I'd say that is too pricey - £90, particularly if a business is not VAT registered is a big spend IMHO. Brass tacks - the seats are empty, so let's forget deducting the ticket price and looking at the net cost of food, beers etc. Whole package should be about getting it full, getting bums on seats (which as I say are empty anyway) and generating at atmosphere which A) people want to book again as a hospitality event either under their own steam with clients or as a day out with mates and B) get's them interested in the football element? Two course meal, admission to game, half time refreshments, pay bar, team lines and programme. Pretty similar product to whats on offer at ICT. The food is far superior to that since ICT changed supplier similar in quality to red poppy. I’ve said on here before, and maybe the club have tried this and I’ve missed it, but I often wonder about maybe making hospitality a bit more informal from time to time. Instead of sit down meals and bars what about having some local butcher come along and cook up some burgers, have some fun kids activities indoor or outdoor, meet the players / manager before / after the game and make it just a bit more of a thing for every age of fan. Younger fans can play some football with their pals, meet their heroes and get some food, older fans can chat with players, have a drink and also get some food. I’m surely over simplifying things and perhaps I have missed similar events in the past but just thought it’s worth mentioning regardless. This is a great idea. I know the club have changed hospitality in the past lowered prices and content but making it more family friendly is a great idea. Could go as far as offering match day kids birthday parties. As a parent of three boys all starting football at school this would impress their mates no end. My daughter had her birthday party there. Wasn't match day, they don't do it when a game's on. FYI it's not cheap at £180 for a max of 12 kids. She really enjoyed it though. When my kids were little back in the first division first time round the club did family hospitality a couple of times a season. All the players were involved after the game. At one there was a giant chocolate fountain and my kids still go on about that day. My youngest won a signed ball, every table had one to win, and it’s still pride of place in my living room. Stuff like this should be done again. It was always a sell out.